It’s the game nobody aims to play in, but once there it’s not a game anyone wants to lose. 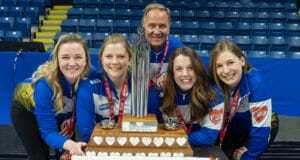 The Bronze Medal game was played at the Scotties at the EnMax Centre in Red Deer Sunday morning, and Jennifer Jones’ Manitoba crew coming off a heart-wrenching loss to Alberta’s Heather Nedohin in Saturday’s semi-final, regained their composure for an 8-6 win over Quebec’s Marie-France Larouche. The Manitobans put up a deuce in one, before Quebec answered with two of their own. 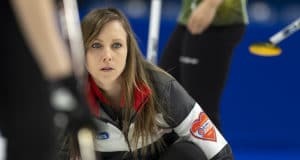 Jennifer Clark-Rouire played the first two ends at lead, with Dawn Askin up to the two-spot before Jill Officer rejoined the squad in the third. Quebec stole three and four, actually Jones had a shot for as many as five in the fourth but ended up giving up the steal. The teams swapped singles before the big end, seven, when Jones executed a perfect hit and stick for a quad, and Larouche just could not recover. For Jones, the win was nice but didn’t stop the sting of the measurement loss Saturday night. For Larouche, the feeling was not so bright. “For right now I am disappointed for sure,” says Larouche, holding back tears. For Larouche, who lost the final the last time the Scotties was here in Red Deer to Colleen Jones in 2004, it was almost too much to bear. “I think we played more games this week together than we did all year,” she said. Is it a painful growing experience necessary to get to the next level? For Jones the curling year will end with a couple of cashspiels, including the tour championship. Will the team roster stay the same moving forward? “In my mind it is, I haven’t asked them. I just think they’re perfect teammates and terrific human beings. The Gold Medal game goes at 1:30 p.m. with B.C.’s Kelly Scott taking on Alberta’s Heather Nedohin.